Zucchini and other summer squash are very prolific. Therefore, one can never have too many delicious, quick recipes for them. This one is a family favorite. 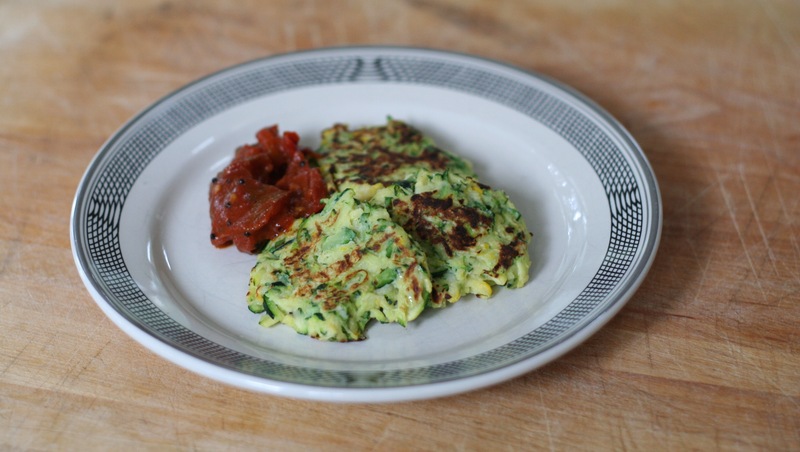 I’ve found that even finicky kids and hesitant adults are willing to try these tasty zucchini fritters; and unsurprisingly to me, they always love them. In the photo above, the fritters are served with a tomato chutney I happened to have on hand. But these versatile fritters are good plain, or with applesauce, sour cream, or an Asian soy- or fish sauce-based dipping sauce. Many recipes for zucchini fritters instruct you to fry them in a generous amount of oil. I find a good spray of oil on the bottom of the pan works just as well and results in a less greasy fritter. 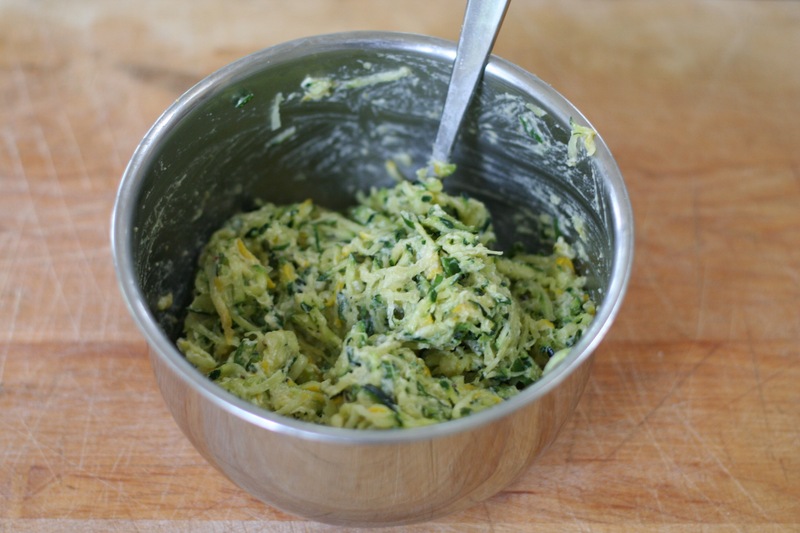 Grate the zucchini using a box grater or food processor. Toss the grated zucchini with the 1 1/2 teaspoons salt, place in a colander, and allow to rest and drain for 10 minutes or more. 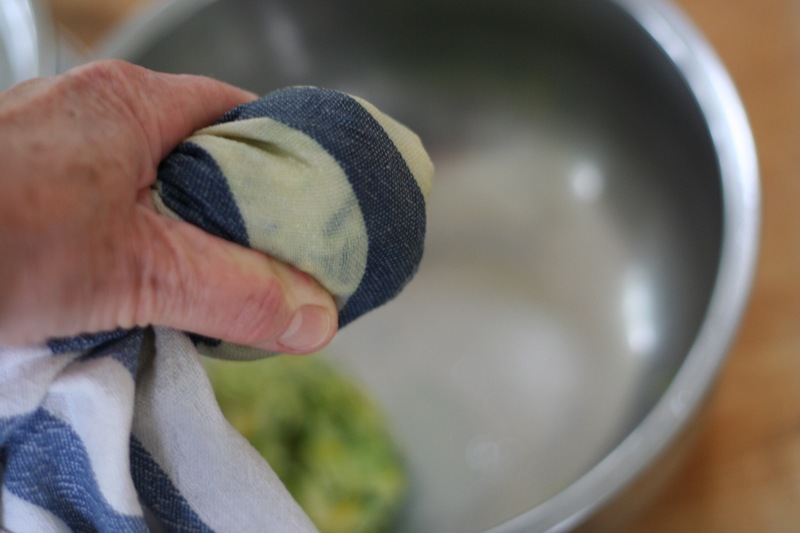 Squeeze the grated zucchini in your hands or a clean dish towel to remove the excess liquid. Combine the zucchini with all of the remaining ingredients except for the vegetable oil. Stir to mix well. Heat a large, flat-bottomed skillet or griddle pan over medium heat. Spray or wipe the heated skillet with a thin coating of vegetable oil. Scoop up generous portions of the fritter batter with a tablespoon and shape the batter into a 2-3 inch patty. Drop the patty into the hot skillet. Press with the back of a spoon to flatten the fritter into a small pancake. Fry until the bottom is nicely browned. Flip the fritter over and cook the second side until browned as well. Remove from the pan. Serve with a sour cream sauce, tomato sauce, apple sauce, or whatever strikes your fancy. Fritters are best eaten within 30 minutes of being made, but my family also enjoys them reheated as leftovers. They make a great after school snack. Fritters can be frozen. Reheat in the microwave or defrost and heat in a low skillet or oven. 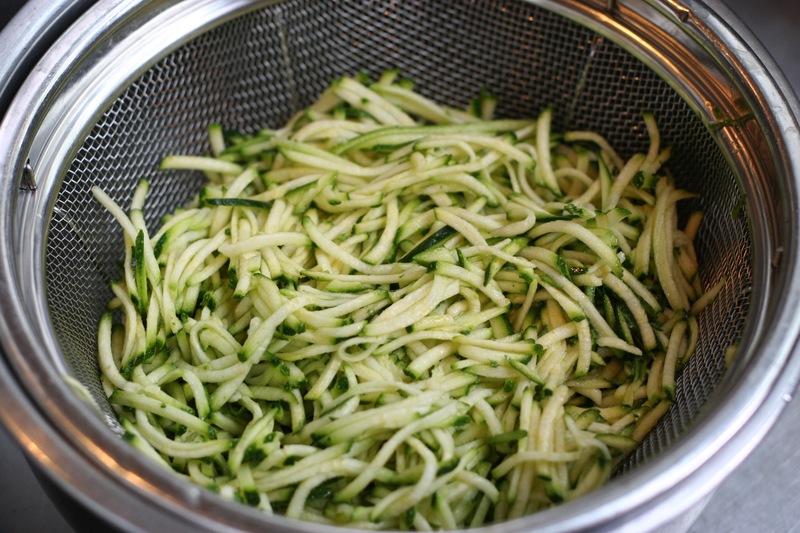 Toss the grated zucchini with the salt and allow to rest in a colander for at least 10 minutes. Squeeze the grated zucchini to remove the excess liquid. Combine the zucchini with remaining ingredients and mix well. This entry was posted in Appetizer, Sides, Vegetarian and tagged appetizer, can freeze, fritters, kid friendly, quick entertaining, vegetarian, zucchini. Bookmark the permalink.